SOLD OUT! Subscriptions for the 2014/2015 Portland Arts & Lectures series are SOLD OUT at all levels. Please sign up for our eNews at the bottom of our home page to be the first to know when next year’s subscriptions go on sale. 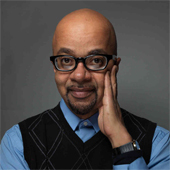 James McBride won the National Book Award in 2013 for his third novel, The Good Lord Bird. Ann Patchett calls the book “the most electric, provocative, and funny (I mean really funny) book I’ve read in years.” McBride is also the author of the bestselling memoir The Color of Water: A Black Man’s Tribute to His White Mother and his first novel, Miracle at St. Anna, was adapted for the screen in a movie directed by Spike Lee. An accomplished musician and composer, McBride has also toured as a saxophone player and written songs for Anita Baker and Grover Washington, Jr. He is currently a Distinguished Writer in Residence at New York University.